Watch Video Previews for FREE! My friend joined a gym and asked me to help her train. I love sports and like to feel strong and healthy so maybe I will be good at this. I can not wait to go to the theater! I bought tickets for Romeo and Juliette and I will enjoy a great play, I am sure. I adore going to the theater. Tomorrow, being the weekend, I will rest at home. Maybe go to the cinema. I want to see -The Bye Bye Man-. I love horror movies). But I would very much like to watch with my beloved man. In 2008 my good friend Joe, his friend Bill and I met for lunch at our health club complex. Joe explained that Bill had been trying to talk him into joining him on a trip to Russia. The goal, that Bill would find true love in the former USSR and bring his "beauty" back to the U.S. I am sure I gave Joe a look that communicated that I thought his friend was desperately pursuing a pipe dream. At the time I had never heard of Russian dating or Russian brides. I had never even met a Russian or anyone who had. However, keeping to his plan, Bill did visit Russia and came back with pictures of a lady named Olya, a lady to whom he had promised to bring back to the U.S. and marry. Skeptical, I asked if he was really going to go through with it. But it was clear from the way his face lit up when he spoke of her that he was indeed going to marry the lady. He explained that he had intended to meet four other ladies but he dropped that plan when he met the first lady, Olya. He spent his entire two weeks with her only. I can't say his story was entirely illogical because after seeing her photos and listening to his description of his time with her, it was quite possible that he'd found a high quality lady, if not his soul mate. However, I still remained skeptical and soon forgot about Bill and his hopes for starting a family with his exotic Russian bride, Olya. That is, until one day in January 2011 I bumped into Bill and Olya at the health club restaurant and ended up joining them for dinner. Let me say, I was breath taken and for a number of reasons. For starters, she looked even more beautiful than the photos Bill had shown me three years ago. And with all due respect to Bill, he is an average looking man at best. Even more surprising than her beauty was that she was all over Bill, holding his arm, hugging him, giving him little kisses on the cheek from time to time. To use a baseball metaphor, it appeared that Bill had hit himself a grand slam. After shaking Bill's hand and getting a friendly kiss on the cheek from Olya, we parted ways with the promise to not be such strangers. It did not take long for me to seek out Bill's advice on how I too could find a Russian bride like Olya. Not only was Bill helpful but Olya too was very excited that I had endorsed the concept of meeting Russian brides. Bill referred me to GlobalLadies.com, and told me to post a decent picture of myself on the site. Next, they suggested that I search for at least six ladies within a relatively close proximity of each other, within a 300 mile radius, and send an email to each lady briefly describing myself. Olya, in a gentle way, reviewed my biodata and made some suggestions that she said would increase my "handsomeness". I love how foreigners use English words. Bill suggested I would need to get the telephone numbers of all the Russian brides I intended to visit before boarding a plane. Bill and Olya were a great asset in my search, and if not for them, well, this article would never have been written, and I would have still been in the mindset that finding a foreign bride was for losers. 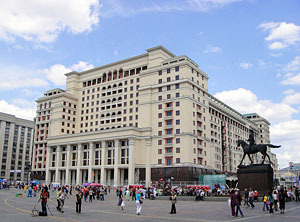 On March 7th, 2011 I departed for Moscow where I would meet Elena , my first pick, at 3PM the following day in the lobby of the Moskva Hotel. Well, my flight did not arrive until 11AM the next day and I didn't make it to the hotel until 2PM. I was a physical wreck from the flight and since I didn't make it to the hotel until one hour before my scheduled meeting with Elena I didn't have much time to prepare for a good first impression. So, I threw my luggage on the bed and tried to revive myself with a quick shower and then made a mad dash for the lobby. I managed to be only fifteen minutes late for our meeting at the hotel entrance. As luck would have it Elena was also fifteen minutes late and she walked through the door the same time I arrived. From the pictures I felt sure that it was Elena, but why was she carrying flowers..? Could it not be her? 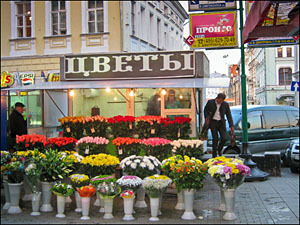 Is it customary to give flowers to men in Russia? Wait, this must be a different lady and Elena is still yet to arrive. But then, the lady walked right up to me and said, "hello, are you Michael". Yes, I said with a confused joy. The joy part was that she was extremely pleasing to the eyes, and the confused part was, "why is she holding flowers". In any case, the flowers did not get in the way of her hug. I am sure she could see that I was very pleasantly surprised. I was also very hungry and suggested that we get a bite to eat somewhere. So, we exited the hotel and not more than twenty steps later, a man said something in Russian and handed Elena another flower. Then, two more men further down the sidewalk said the same thing while they walked by. Very confused at this point, I asked her if she knew these men. But all she said was, "no". We must have walked a total of six blocks with other men greeting her with the same phrase in Russian. I was completely baffled, what in the world is going on in this strange country? Are people here so friendly that they say hello to everyone they pass on the streets? Was she someone famous? Interrupting my rambling thoughts, she reached over and grabbed my arm and said, "TGI Fridays?" I did a little double take, did she just say what I think she said? I said "sure". We then walked, her hand still holding my arm, past a sprawling market and into a, yes, TGI Fridays. When we took our seats our waiter, a young Russian man, handed us menus, one in English for me. He then handed Elena a rose and spoke the words in English, "Happy Women's Day". At that revelation it all came together. Laughing, I told Elena how confusing it was to see all these men giving her flowers, and her meeting me with flowers but not giving them to me. She also began to laugh and it was at that moment that I started falling for Elena and her wonderful laugh. Even today she will sometimes bring me some flowers. It's kind of a joke but it is also a powerful reminder of our first meeting and what we mean to each other. I am so thankful that Bill was the pioneer and introduced me to the concept of meeting Russian brides abroad. Elena and I are extremely pleased to announce that we will be having a child early next year. Foreign men seeking to find Russian brides will find these articles very informative. There are many tips as well as advice for dealing with the issues associated with Russian personals dating. Many articles relate to the social psychology of Russian brides matchmaking and the mentality of Russian women in general. So, have you decided to connect with a Russian woman or two via online dating? If yes, that is a good start, but you will need to learn more about the culture and traditions of Russia and Ukraine before you actually meet Russian girls in person. Hopefully these newsletters will assist you in this ongoing effort. The worst mistakes men make in their first emails. Read this if you want Russian brides to note your letter from among the others. Don't repeat common mistakes men make in their letters. Is the process of meeting a special lady going to take long? How to make a searching of single Russian women and Russian brides fast and painless. Language barrier. Learn how to navigate this barrier. Many Russian women speak English quite well, a few not at all, but most speak at least some English. Where to meet Russian brides? Make your choice. There are many Russian-speaking countries where you can meet women from all walks of life. A typical Russian bride: her portrait. Get an overview of the typical Russian bride you can find on the Russian women dating sites. Russian brides and feminism. Some interesting quotes about feminism from Russian brides diaries. What are Russian mail order brides? Is there any validity to the terms "mail order brides" or "Russian mail order brides"? Lets get rid of stereotypes about meeting women overseas. What is it like to be a Russian bride of an American man? An interview with a Russian bride who married an American man and moved to the USA. Chance For Love, Russian Women Online Dating Network, Copyright © 2003 - 2018, All Rights Reserved.